The advantages of synchrotron x-ray facilities for high-pressure science have been well recognized, as evidenced by the enormous advances in high-pressure science across many disciplines at synchrotron sources in last two decades. As one of the original and longest-running high-pressure beamlines in the world, the X17 facility at the National Synchrotron Light Source (NSLS), Brookhaven National Laboratory, continues to play a key role in the development and application of high-pressure synchrotron techniques in condensed matter physics, materials science and geosciences. These dedicated high pressure beamlines at NSLS, which were designed and operated by Carnegie for many years, are among the most productive high-pressure research facilities in the world. At this workshop, an overview of the achievements at these facilities, especially for the diamond anvil cell (DAC) beamlines X17C and X17B3, will be given by beamline staff and users. The workshop theme also covers the recent progress in related theoretical calculations and methodologies, instrumentation and facilities, data collection and analysis strategies for high pressure research using synchrotron x-ray beamlines. In addition, the program aims to highlight the new achievements, techniques, and developments in synchrotron sources which will benefit the current, ongoing program of design, development, upgrade and operation of DAC high pressure beamlines for NSLS-II. The workshop will also provide students, postdocs, and new potential users with an excellent introduction to high-pressure synchrotron techniques and science. 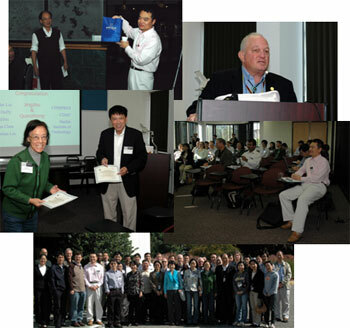 This workshop is organized in honor of Jingzhu Hu and Quanzhong Guo in celebration of their retirement after up to 18 years of dedicated service to the high-pressure community. This is an appropriate time to review the achievements of the high-pressure community at NSLS and to look forward to the future of the facility and the new opportunities that will be made available with the development of NSLS-II. It is anticipated that the workshop will stimulate collaborative efforts, not only in high pressure science but also toward taking advantage of the unique features of synchrotron x-ray beamlines.